Deputy Prime Minister and Leader of Liberal Democrats, Nick Clegg today became the first party leader to announce that funding for the Holocaust Education Trust’s ‘Lessons from Auschwitz’ project would be safeguarded for the next 5 years. He said that he would ensure that any Government including the Liberal Democrats would allocate the funding and described the £9m budget over the five years as ‘worth every penny’. Mr Clegg described the project as the ‘cornerstone’ of holocaust education in the UK and one of the best initiatives of its kind anywhere in the world. The ‘Lessons from Auschwitz’ project means every school and college in the country has the opportunity to send two students aged 16 to 18 to see for themselves what they had only previously read about in books or seen on television. This unique educational programme includes a visit to Auschwitz and a seminar with Holocaust survivors. Now in its 16th year, the project has taken more than 25,000 students and teachers to the Nazi concentration and death camp Auschwitz-Birkenau. This new £9m funding until 2020 would provide for 14 projects and 3,000 students every year for five years, meaning a further 15,000 students are able to take part. The Trust’s current funding ceases at the end of 2015. Mr Clegg visited Auschwitz in October 2012 with 200 school pupils on the 100th visit arranged by the trust. The most senior British politician ever to join the visit, he was deeply moved by the experience and fully committed to ensuring the project is properly funded so it can continue in its current form for future years. 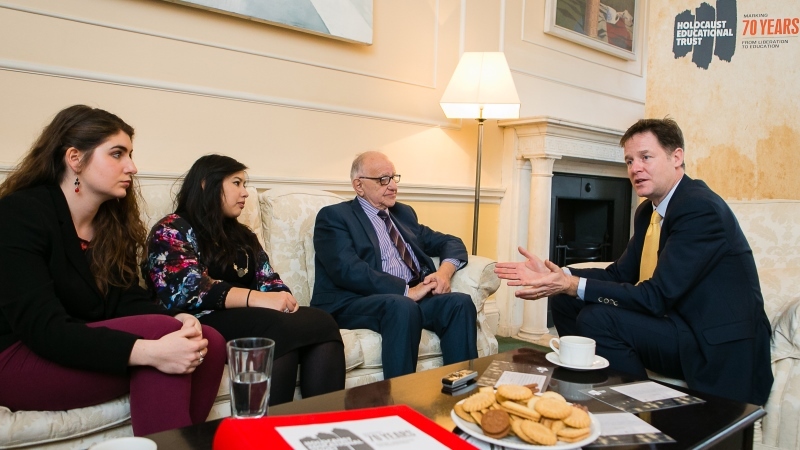 Mr Clegg made the announcement whilst hosting Auschwitz survivor Zigi Shipper for a special meeting in his office where he was also reunited with two young people who visited Auschwitz with him in 2012. The meeting was set up to discuss the upcoming 70th Anniversary of the Liberation of Auschwitz and what role young people can play in remembering the Holocaust in the years ahead. “Holocaust survivors have bravely told their stories for many years. “We cannot remember and re-remember their testimony enough. Because forgetfulness allows prejudice and hatred to rise again, as we can see from the atrocities still perpetrated today. “The horrific events in Paris last week are a shocking reminder of what happens when warped ideologies and prejudice go unchecked. “Remembering the Holocaust is not just a history lesson. It is one of the greatest antidotes we have to anti-Semitism and extremism of all kinds. “Sadly there will be a time when there are no eyewitnesses left. This makes the work of the Holocaust Educational Trust even more important. “The ‘Lessons from Auschwitz’ programme is the cornerstone of holocaust education in the UK and one of the best projects of its kind anywhere in the world. “That is why the Liberal Democrats are absolutely clear in our commitment to funding this vital programme for the next five years. The £9m funding from the Department of Education is clearly worth every penny.